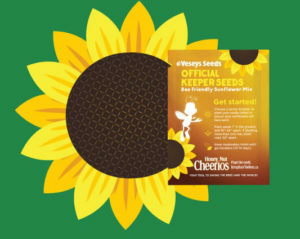 Request a FREE pack of Vesey’s sunflower seeds from Honey Nut Cheerios Bring Back the Bees promo! They’re giving away over 520,000 seed packs to Canadians. You can also get a FREE youth T-Shirt. Just look for PIN codes on select boxes of Cheerios, Honey Nut Cheerios, and MultiGrain Cheerios, and sign up through the link below.